Story and photos by Pam VanderPloeg copyright 2018, unless otherwise noted. 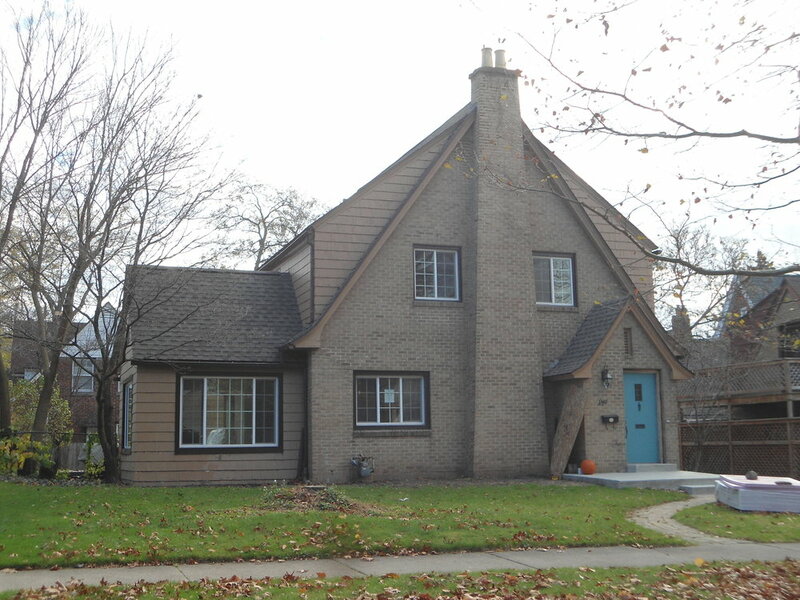 Ottawa Hills is one of Grand Rapids finest neighborhoods of beloved vintage 1920's homes. 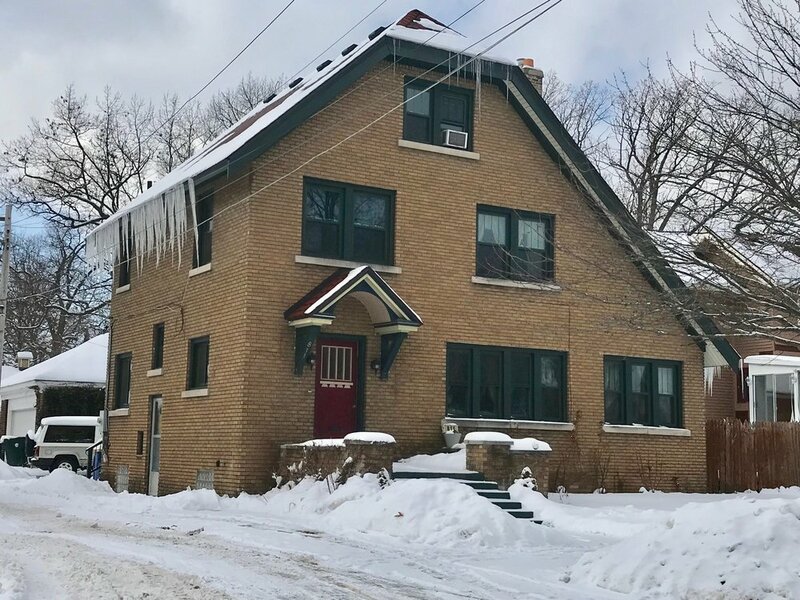 The homes are set back a nice distance from the street on good-sized lots on curving streets with Native American names such as Mackinaw, Chippewa, Cadillac, Seminole and Pontiac in homage to the earliest inhabitants of the area. The neighborhood boundaries are Giddings on the west, Franklin on the north, Hall on the south and Cadillac on the East. There is an additional portion of Ottawa Hills that was platted last, the Indian Hills addition but that is now part of the adjacent city of East Grand Rapids. 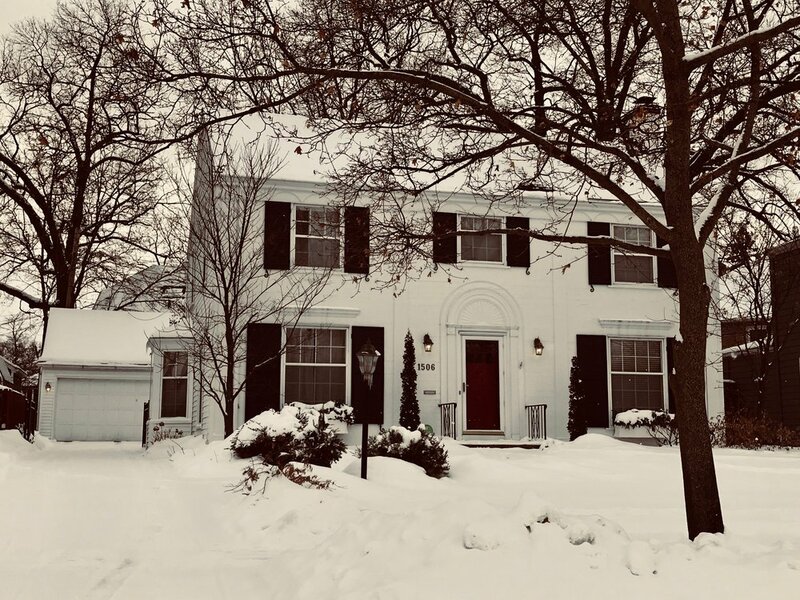 The Ottawa Hills Neighborhood is located on land once occupied in succession by the 5th Avenue Golf Course, the Highland Golf Course, the Grand Rapids Golf Club. At least two clubhouses were built and one burned. The second clubhouse was designed by the architectural firm of Osgood & Osgood. 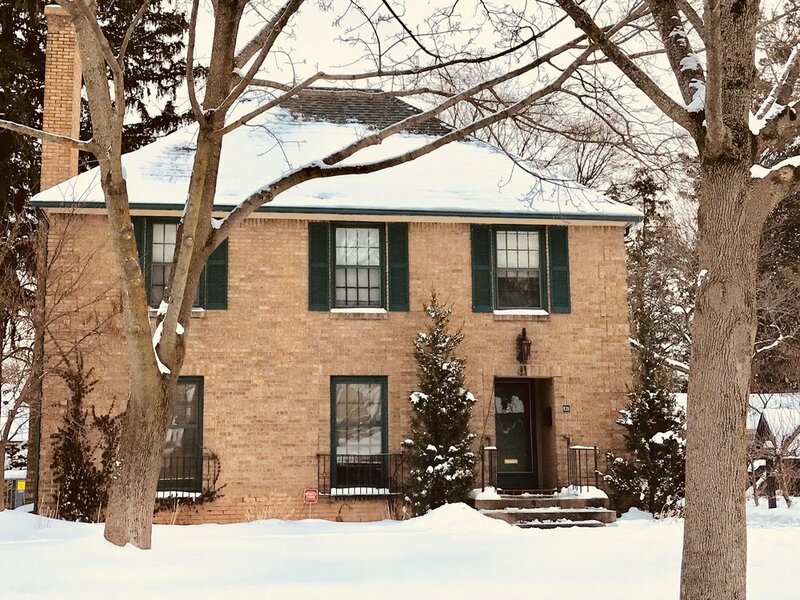 There is now a home designed by Alexander McColl located on the hill at the site of one of the golf clubhouses at the corner of Mackinaw and Iroquois. According to a story in published in the Grand Rapids Herald, in 1922 William H. Gilbert, S.R. 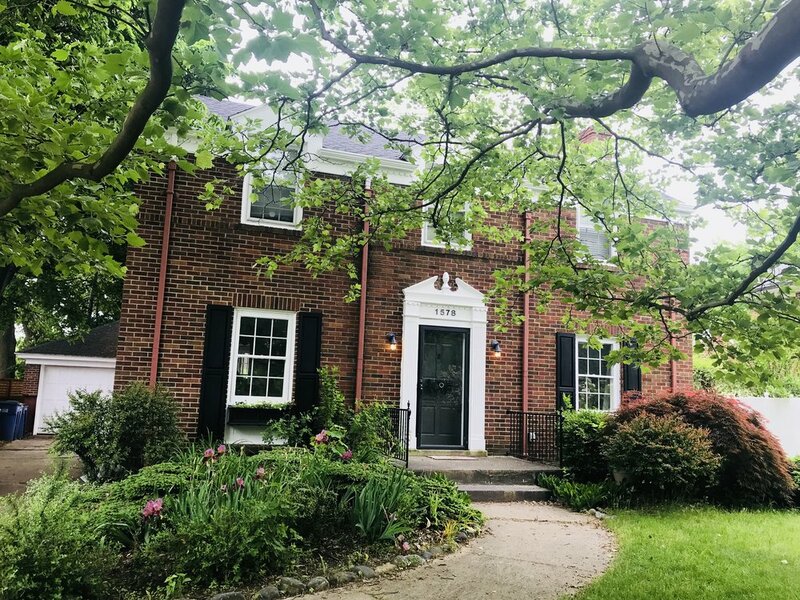 Fletcher, Adrian Dooge and Harold T. Fletcher sat down in an orchard near Franklin Street and Giddings Avenue to plan a new upscale development of fine houses. The formed the Ottawa Hills Land Company and platted the first section. The los offered for public purchase in 1922 sold out in two weeks. It was on one of those early lots that Alexander McColl designed, and A.E. Blakeslee built, two of the first houses in the district. The house shown below is located on Pontiac near Franklin. 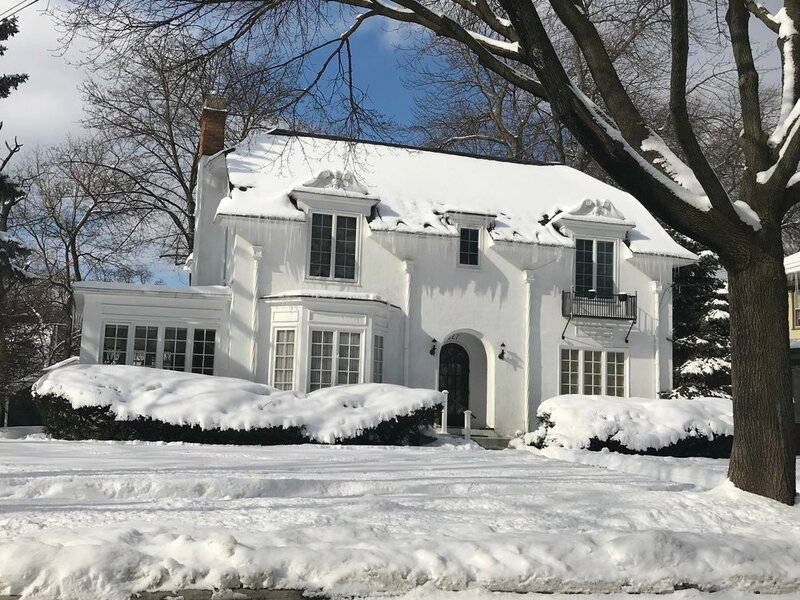 One of the early homes built in the first phase of the new Ottawa Hills neighborhood was designed by Alexander McColl and built by contractor A.E. Blakeslee. 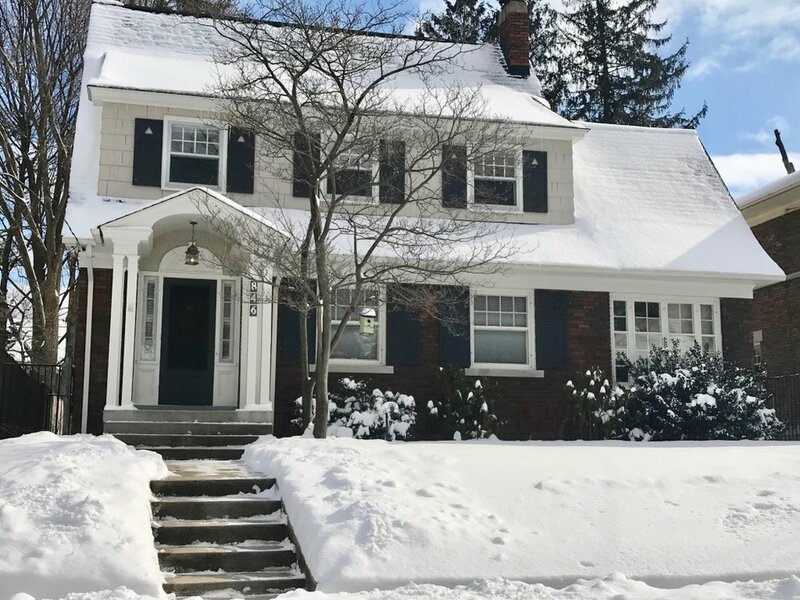 This English cottage style home on Giddings has a maid's quarters on the third floor with a full bath and original claw-foot tub. The first area sold out within two weeks and lots in the second platted area were made available in 1923. 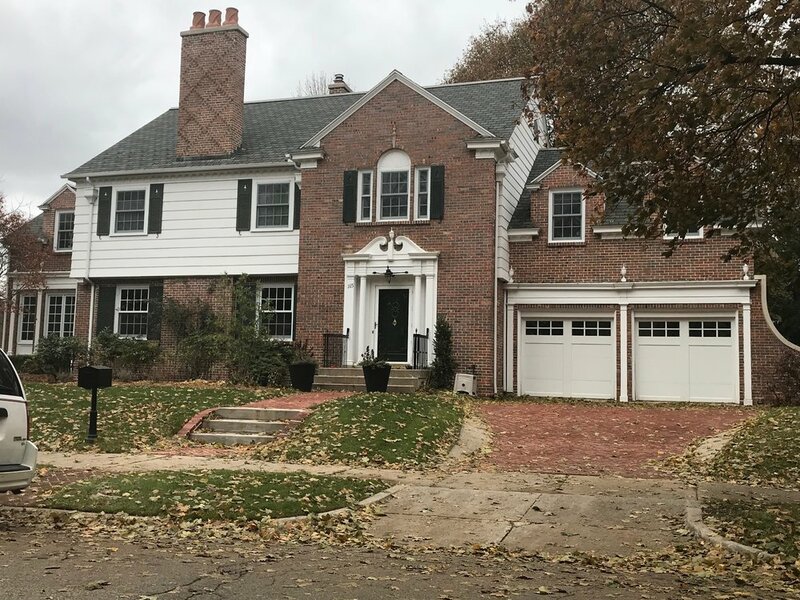 Prosperous and interesting Grand Rapidians purchased landand built houses in this neighborhood and it is their stories that bring these beautiful homes to life. For example, well-known artist Reynold Weidenaar lived in the neighborhood in on in one of the homes shown below on Giddings Street. When his wife moved out of the home, she left behind some of this artwork in the attic. A relative of my husband, who bought the house, contacted her to come and claim them. 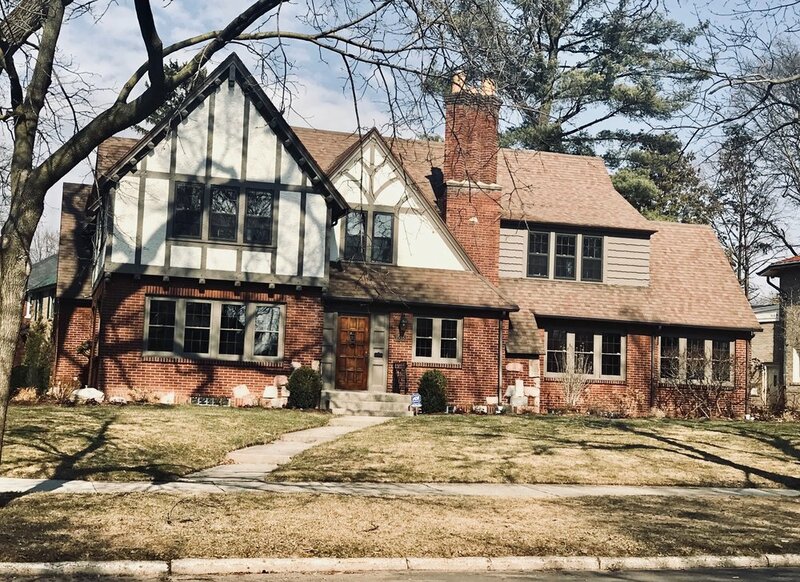 Regarding the types of houses in the neighborhood, there is an abundance of English style Tudor and medieval cottage styles. 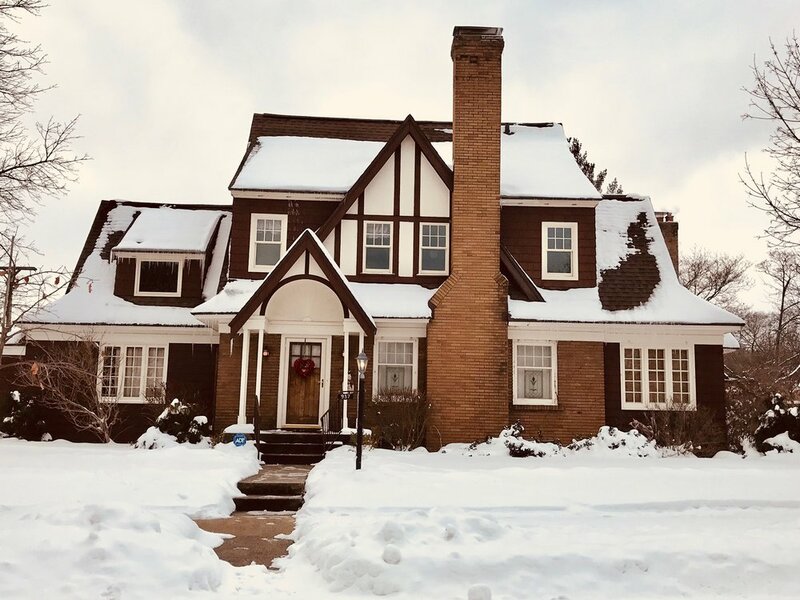 Also true to the trends of the 1920's, owners commissioned local architects and builders to draw on historic revival styles to construct impressive Georgian, French Eclectic, and Southern Colonial homes, and, at least one romantic Italian renaissance confection. 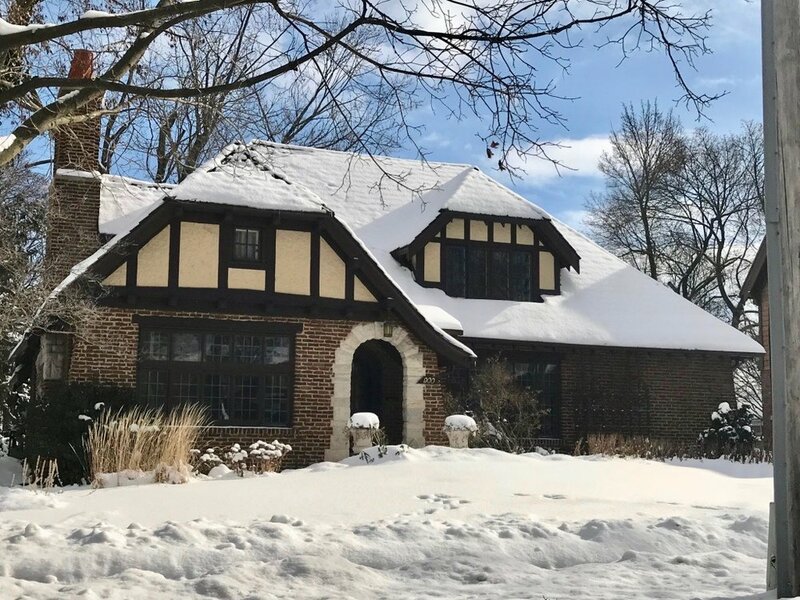 These homes were built in the prosperous pre-1929 stock market crash days and some included maids quarters like this large English cottage style home on Giddings. It is unclear if any of the families actually had servants. Examples of historic revival style homes built from 1924 - 1930. Although the abundance of homes were built by 1930, as shown above there were still quite a number of homes completed from 1930 into the early 1940's. 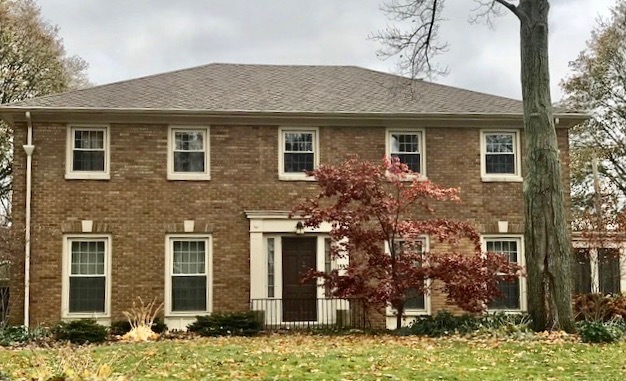 The Grand Rapids Herald published photos, renderings and floor plans for many of the Ottawa Hills homes in the building section of the newspaper. 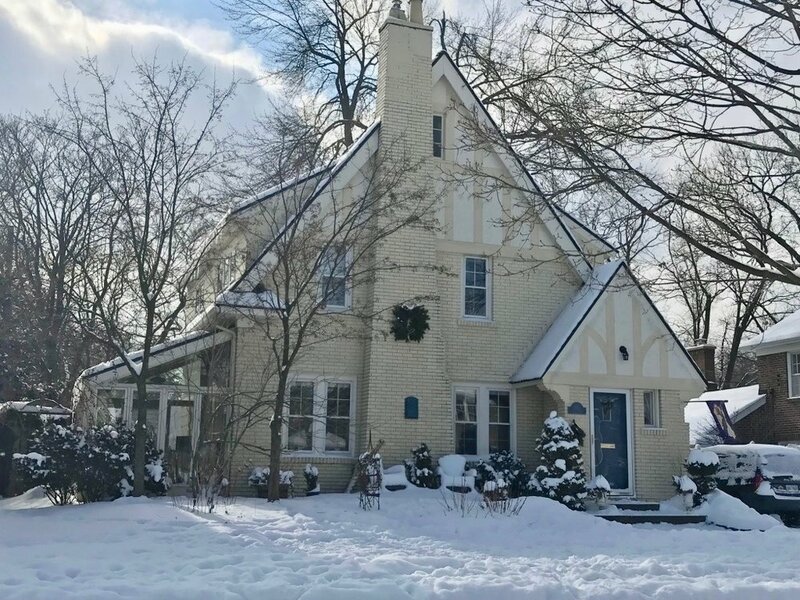 Of the approximately 19 architects and contractors credited as the designers and builders of the 70 Ottawa Hills houses so far documented, Architect Alexander McColl stands out as a popular choice for many homeowners. Other architects included Don J. Lakie, Pierre LIndhout, Adrian Benjamin, as well as brothers Rindge & Rindge, Charles Norton, Ralph Demmons, John VandenBogart, Harvey Weemhoff and Dykema, Carmen & Dykema. At least two women architects, Fannie Boylon and Louise Gilleo, designed homes in the neighborhood. J.O. Barkwell and Archie Blakeslee had a large share of the construction work, and were credited with design as well. Some of the other contractors included E. J. Van Sweden, A. Hoeksema, A.E. Krause, Bolhuis and Oldenkamp Builders. 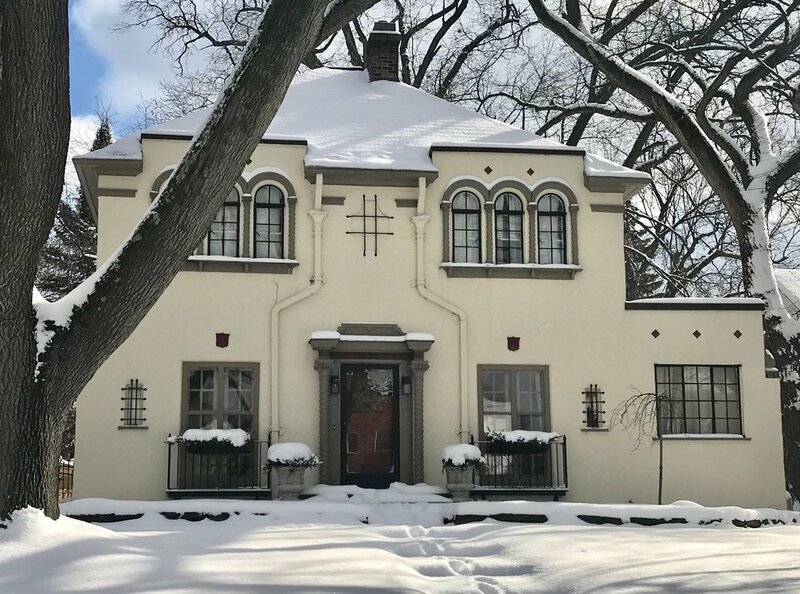 By 1925, the renaissance style Ottawa Hills High School stood at the center of the neighborhood and was designed by Henry H. Turner, a Harvard-trained architect, and his partner Victor Thebaud. This was a strong draw for the neighborhood. Turner had been Grand Rapids Public Schools architect from 1909 to 1919 when he launched a private practice, and was experienced in the progressive school architecture traditions of the day learned from his experience working in the St. Louis, MIssouri and Cinncinnati, Ohio public school systems. The new high school had artistic features such as stained glass, turned columns, art tile, a fireplace and a gold-fish pond in the kindergarten rooms. According the the Grand Rapids Press, the three-story building had progressive features including a separate girls and boys gym, "science labs, metal and woodworking shops, an auditorium, an "olde world" debate room known as "The English Room" and a formal dining area in the home economics classroom." 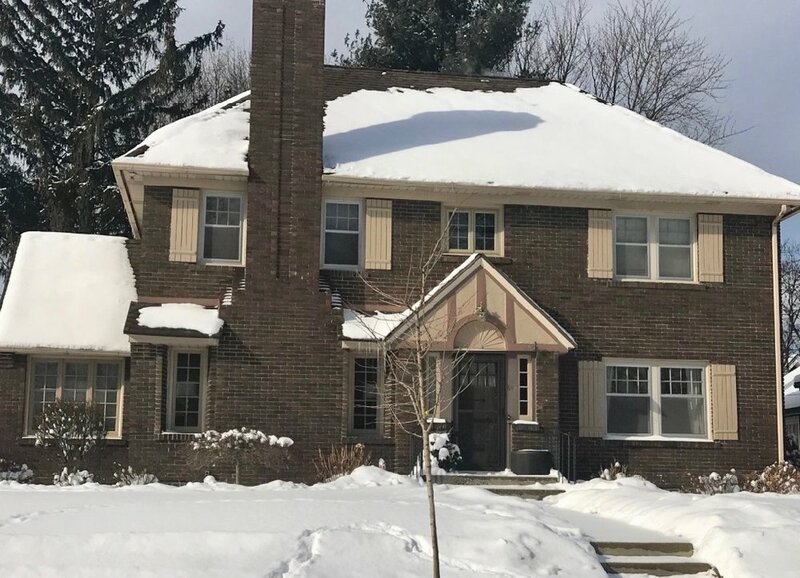 Home by Wilifred in the Ottawa Hills plat that is located in the city of East Grand Rapids. The home was designed by McLaughlin on Alexander. The third phase of the Ottawa Hills development opened up lots in 1927. It was referred to at least one document as the Indian Village, an area that was tree-covered and provided a park-like setting for the neighborhood. This area is located in the city of East Grand Rapids. In 1927, East Congregational Church became a new neighborhood when they purchased land on Giddings. Ralph Adams Cram, renowned New England architect and expert on English and French Gothic church styles from Boston was commissioned to design the new church. The lovely English Gothic style of the church complex is in harmony with the aesthetics of the Ottawa Hills neighborhood. 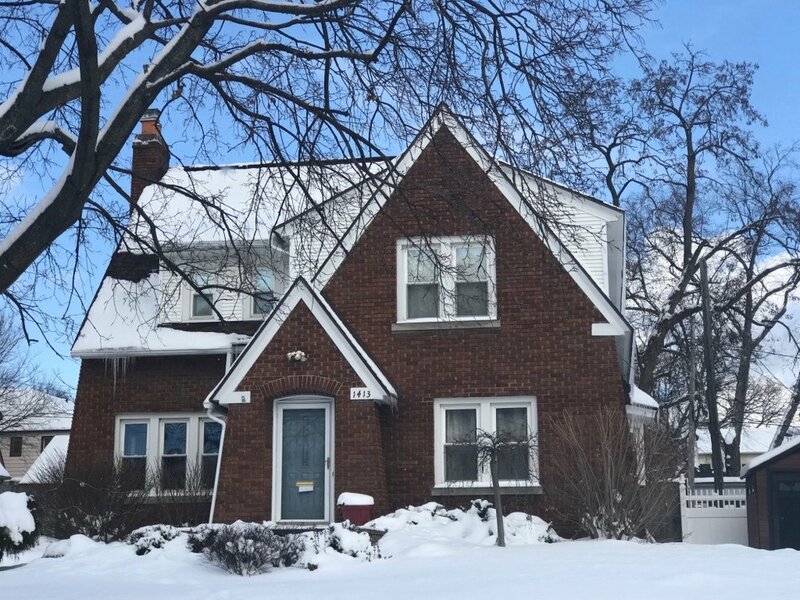 Today Ottawa Hills has high appeal as a neighborhood of stylish, historic homes that are in high demand and well-maintained. 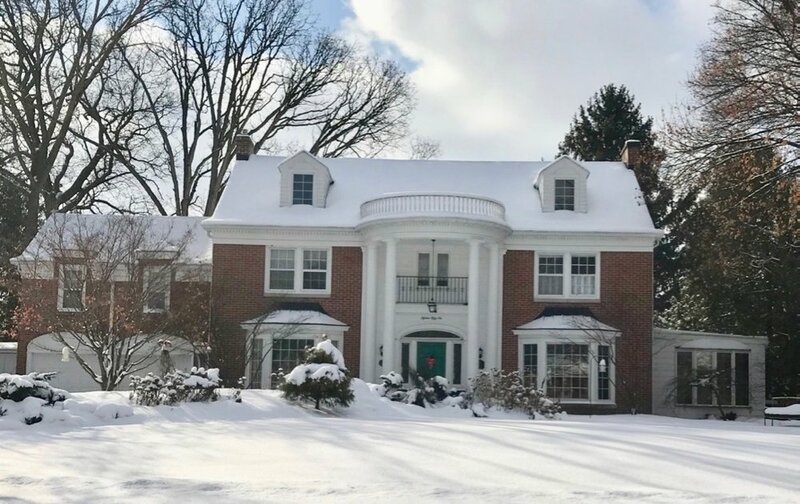 The current Grand Rapids Christian Elementary School was built in the place of that 1925 Ottawa Hills High School and has been another draw for young families attracted to the walkable neighborhood. 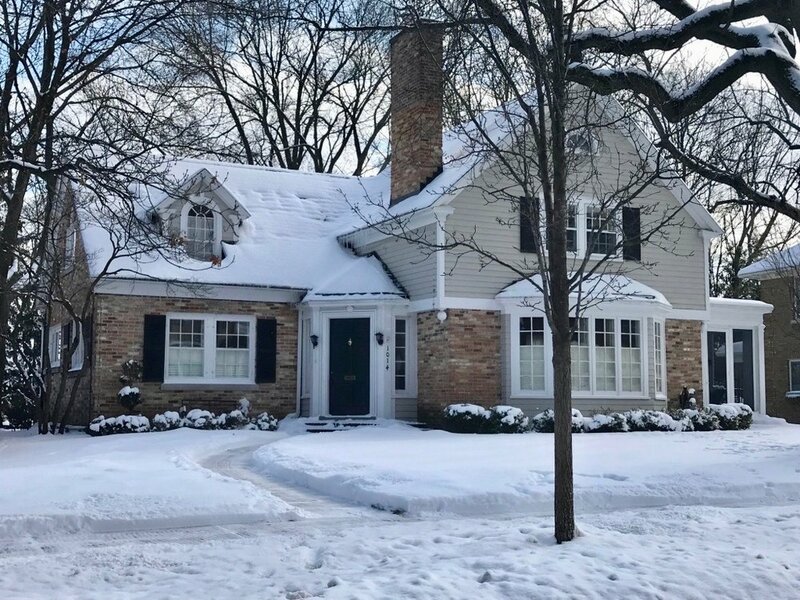 The following is a gallery of homes that represent the variety of design styles in the neighborhood.